Finedon Dolben remain in control of their own destiny at the top of the Hevey Building Supplies Northamptonshire League, despite them missing out on victory at Horton House last weekend. It proved to be a remarkable afternoon at Denton Road with the leaders having to settle for the smaller share of the spoils in a draw as they finished just two runs short of what would have been another crucial success. Batting first, Horton were restricted to 182-8 from their 50 overs with Ben Coddington (54) being the standout performer while both Vicram Sohal and Jack Chopping took two wickets each. In reply, Williams Knibbs (5-41) ensured no member of the Finedon order could really get going and the leaders were staring down the barrel when they were reduced to 160-9. Captain Callum Berrill (36no) and number 11 Tom Brett (9no) worked their team back into it, although they ran out of time as they eventually closed on 181-9 after 50 overs. This was Dolben’s game in hand on fellow high-flyers Old Northamptonians and their draw looked an even better result after Peterborough suffered a surprise four-wicket defeat at Brixworth. It means Berrill’s men hold a 31-point advantage at the top with six games to go, the next of which is a home clash with Geddington on Saturday. It was a dream day for Desborough as they regained the initiative at the top of Division One. While they were claiming a comfortable 98-run success over Isham at West Lodge Park, their other rivals in the race for promotion to the top-flight all lost. Morning leaders Overstone Park went down by six wickets at Wellingborough Town, third-placed Loddington & Mawsley were well beaten by East Haddon to the tune of 86 runs and Stony Stratford were thrashed by the same margin at Weekley & Warkton. There were no problems at all for Desborough though. 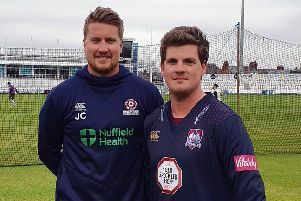 Captain Jack Bilson struck a superb 137 and shared an opening-wicket stand of 182 with Simon Renshaw (65) to put the hosts on their way to a big total of 283-5 before they declared after 47 overs. Andrew Law produced a decent display for Isham, returning figures of 12-0-72-4. But the visiting batsmen never looked like mounting a serious run chase with only Chris Perkins (64) and Simon Court (55no) making any sort of impact against a disciplined attack. Lee Pollard (3-10) and Sam Harris (3-23) led the way for Desborough as the visitors were eventually skittled out for 185. Weldon produced a superb run chase as they edged ever closer to another promotion with a six-wicket success over Geddington 2nd in Division Three. Chris Harrison (93), Lee Sutherland (70) and Bayes Day (40) sent Geddington to 246-8 in their 50 overs while Dave Freebody (5-41) took the bowling honours. But Weldon produced an impressive batting display of their own as Thomas Chenery (67) and Sinjin Bulbring (55) performed well while Freebody rounded off a superb individual display with an unbeaten 66 to get the leaders over the line on 247-4 with 20 balls to spare. Irchester moved into the second promotion place as their 81-run victory over Horton House 2nd was coupled by a six-run defeat for Old Grammarians at Wollaston 2nd. Thomas Duxson (97no), Jamie Souster (69) and Jordan Everitt (48) were the main contributors as Irchester put a big total of 292-6 on the board. And Horton fell short on 211 as Souster (5-60) helped bowl Irchester to the win. Geddington 3rd made it 15 wins from 17 matches as they maintained their unbeaten record and were crowned champions of Division 10 in the process. Mark Pearson took 4-40 as they restricted Finedon Dolben 4th to 153-7 from 40 overs, despite the efforts of Joel Beeney 49. And the title was wrapped up as they reached 154-2 in just the 19th over with an opening stand of 107 between Brodie Biddle (92) and Dave Wood (34) setting things up.